Join Anna Vasquez of Nested Yellow Jewlery for a lesson in metalsmithing and jewelry making! 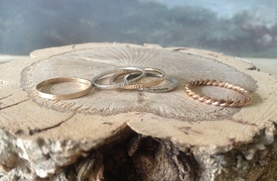 You'll be learning how to transform raw silver and 10K gold into three beautiful forged rings. A kit* will be provided but each set of rings will be unique to your own personal style. This is the perfect class for you if you've ever wondered can I make that? How did she do that? Or wanted to explore your creative passions! Go from raw metals to finished rings in 3 hours. Throughout the evening we'll learn forging and setting techniques, soldering and silver and goldsmithing basics. After the class we'll gather around the table and celebrate our successes with a communal meal prepared by Chef Jason French and a bit of wine.